Saturday was a wet and windy day. The rain was pouring from the skies as I walked up to The Magdalen Road Bakery. A new joint that has opened up in St Leonard’s. 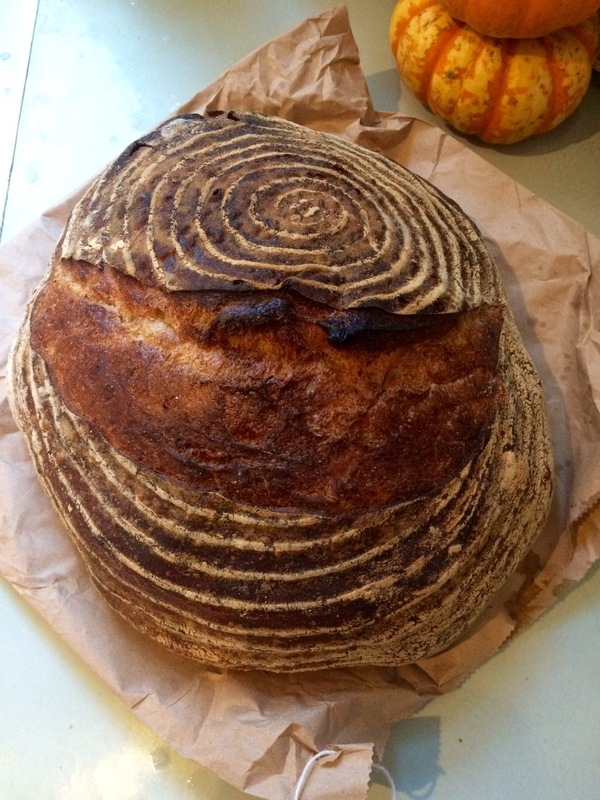 The Magdalen Road Bakery is sister to the Town Mill Bakery in Lyme Regis. It does the same thing but on a much smaller scale.. Boil your own eggs, toast your own toast etc etc. It’s a simple but fun idea and works well in a communal dining setting. Milk, butter and jams are all on table ready and waiting for you to help yourself. The bakery itself has a rustic charm.. Plywood on the walls, solid wood tables and stools. The coffee machine at the front of the store and the large ovens at the back. Gemma and Rich from Cabinet Studios met me there for coffee and cake. We plumped for a rather ginormous eccles cake to share. The pastry was flakey and buttery. The inside was full of sweet currants. It was a piece of sugary heaven. I highly recommend! Tim popped over for a spot of afternoon tea when I returned from Magdalen Road. 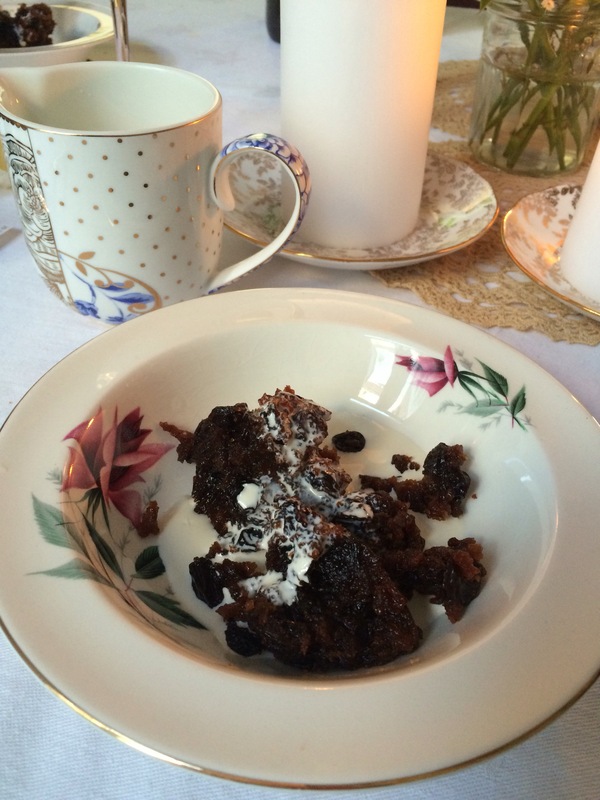 I had baked some festive mince pies and flapjack to have alongside our tea. Out came the fine china from Bell and Blue. It sits so well alongside my vintage pieces. I met up with my chum Cassie for our traditional festive get together. Normally we head off to “The Big Smoke” for a day trip but neither of us could find a full day when we weren’t working. So a late lunch in Jamie’s Italian in Exeter was the next best thing. Cassie met me from work at 2pm and we tootled over to Coal for a glass of fizz. It had a lovely buzzing vibe which suited our festive mood. I hadn’t been for years so it was great to pop in and see what it was like again. 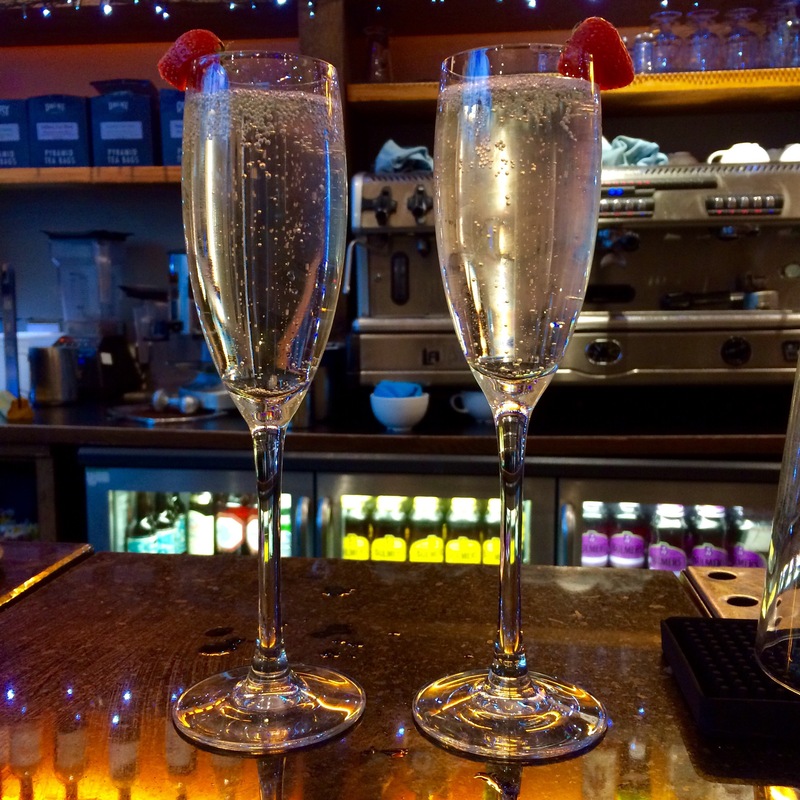 We sat at the bar and enjoyed our festive tipple and caught up on all the latest news. After our drinks we popped next door to Jamie’s Italian where we had booked a table for 3pm. We were seated straight away by a lovely waitress who was very polite. I showed her my gold club card which entitles diners to a few special treats on each visit. You can get one of these cards by filling in an application on the Jamie’s Italian website. With the card you can get priority booking and some tasters. On this occasion we were offered some pumpkin soup as a starter and at the end of our meal some mini mince pies. We perused the menu and made our choices. I fancied the roasted squash, red onion and ricotta salad. Cassie chose the harissa spiced aubergine and we shared some side dishes.. Porcini arancini and polenta chips. The food came out pretty swiftly and was very tasty. I have had varied meals at Jamie’s. Some good and some not so good. This particular visit was good thankfully! The arancini were beautifully crisp with a oozing cheese sauce. The polenta chips were chunky, hot and sprinkled with rosemary and parmesan cheese. So tasty. My salad was very similar to something I might prepare at home and was delicious. Cassie enjoyed her spiced aubergine too.. We both agreed that we had ordered just the right amount of food so we didn’t feel “full to the brim” and had a little pocket of space left in our tummies for our mini mince pies and a special ameretto coffee! Based on this particular visit I would go back to Jamie’s Italian in Exeter. I thought it was good value at about £16 a head. We didn’t order wine so I guess that would bump up the price a little. We were given a generic voucher for £10 off if we spend over £30 on food and drink in January so perhaps I will give it another go in the new year. These past few weeks I have witnessed so many extraordinary and mind boggling sunrises. I can’t help but stop and take photographs whilst others look at the floor and march to work. I urge you to look up sometimes! There is so much beauty in nature. Christmas preperations were in full swing this week. I had thought long and hard about our Christmas menu and how I wanted the house to look. The tree is always the main focal decoration in our house. We don’t go in for lots of other decs. I prefer having fresh cut flowers and the odd festive nicnac here and there. If your tree is beautiful I feel you really don’t need much more. Christmas Eve was the beginning of our festivities with Serena coming for breakfast. I wanted to keep it pretty light as we had an ongoing stream of guests throughout the day. I roasted plums with some festive spices and a good glug of Lyme Bay Winery ginger wine and served them with some creamy natural yoghurt and toasted nuts. For those who fancied something a little heavier there were croissants and cranberry toast with my vast selection of jams. Some homemade and some artisan.. A little shout out to Louise’s Larder and Blueberry Brothers for their wonderful jams and to my friend Wanda who had made me the most wonderful marmalade. So fruity and flavoursome. Yum! There was an abundance of wonderful Miles Tea, Heron Valley apple juice and prosecco. 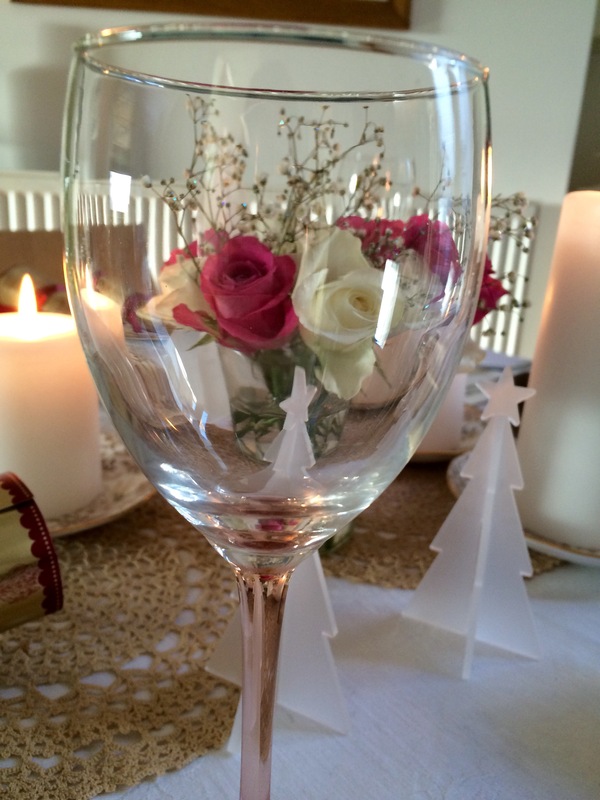 You have to have an abundance of fizz at Christmas don’t you? 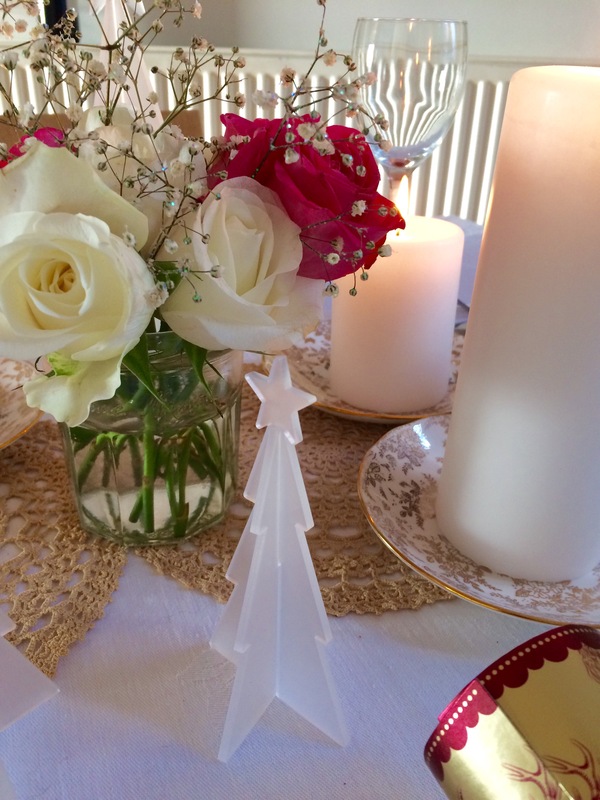 I decided on using my Melli Mello China from Rosalind Bee and think it looks perfect in the festive setting. Lunch time was spent with Steve’s mum and dad, Bridget and Les. 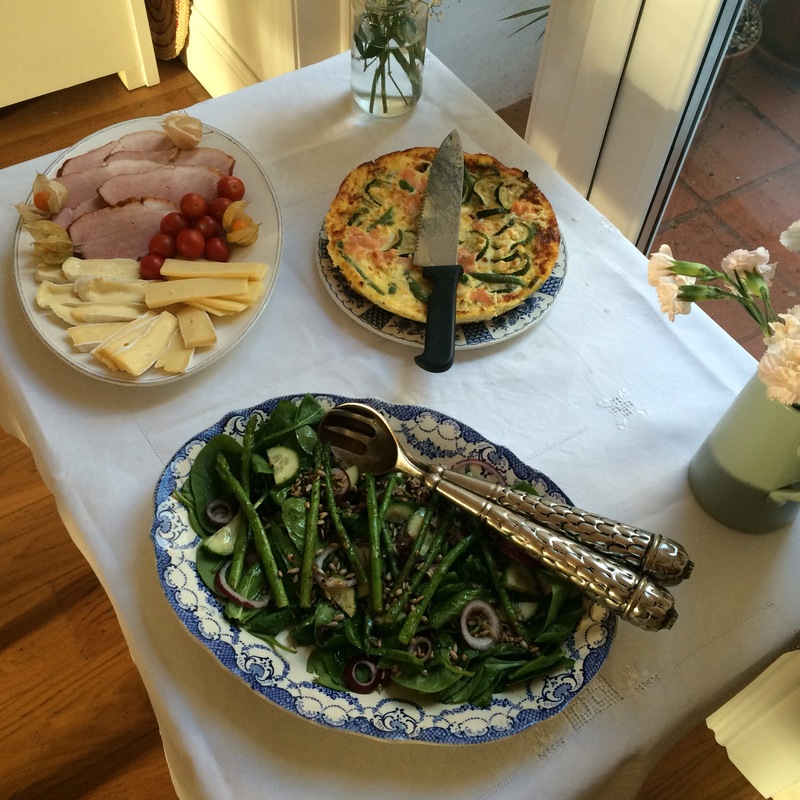 I decided on serving a smoked salmon frittata, cooked ham, cheeses and salads. I enjoy this kind of food because you can make it in advance and guests can help themselves to whatever they fancy. As the day progressed more guests arrived. Alex, who was spending Christmas with us dressed here as Santas little helper, my sisters, Estella and Juliet and my stepdad Tim. I was lucky enough to be able to try a wonderful wine from a local winery, Lyme Bay. Shoreline is a blend of Bacchus and Seyval Blanc grapes from Lyme Bays vineyards situated in the Axe Valley in beautiful Devon. About a 45 minute drive from my front door. You can’t get much more local and special. I am really impressed with the quality of this wine as were my guests. It’s definately worth a try. English wines are on the up and this particular wine Shoreline is very drinkable and easy on the pallet. Great with our Christmas nibbles. My next post will be a round up of my Christmas weekend. I hope that you all have a Merry Christmas and enjoy spending times with your loved ones.